Admit it. The search on your website stinks. How do I know this? Because the search on the vast majority of websites stinks. Fortunately, there are things you can do about it. Getting the search facility on your website right is a hard nut to crack. Its so hard in fact that many fail to achieve it and so users only turn to search if all else fails. Jared Spool suggests that users only use site search if the navigation and information architecture of your site fails. People will search only if they cannot see a trigger word that they think will address their goal. That is because they are just as aware as we are that most site search is awful. If a user is forced to use the search box they fail to find what they are looking for 70% of the time. To add insult to injury Jared says that if a user is forced to use the search box they fail to find what they are looking for 70% of the time! Should you remove site search? Faced with such slamming criticism of search you might be tempted to just remove it entirely and give up. On some sites that maybe an option. Search can be more of a hinderance than a help and the need for it may well be an indication that the site is poorly structured or has become overly bloated. That said, there are also valid reasons for keeping search, especially on larger sites. The design of many site searches are horribly busy. 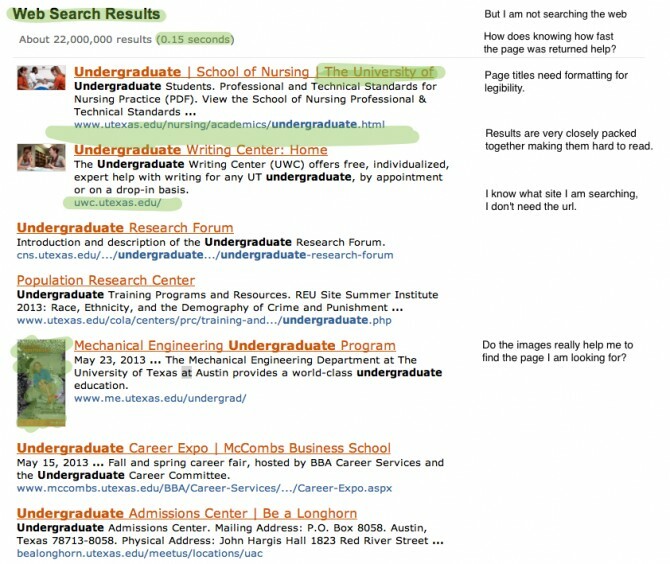 Results are packed too closely together and show too much information, while advanced search tools and filters further confuse the user experience. Start by removing as much as possible from the interface. For example, just because Google shows the URL doesn’t mean you have to. They show the URL so you know the source site, in the case of site search this is unnecessary. Also remove relevancy indicators, file size or any other meta data. All the user needs is a title, link and description. So many site searches are hard to scan. The same is true for filtering and sorting options. Most users will never touch these so either remove them entirely or hide them under advanced search. This is particularly true for sorting. Users want the most relevant results first, other criteria rarely matter. Finally, don’t have separate options for different types of searches. I shouldn’t have to select a radio button to tell you I want to search for people. The system should be able to tell from what I type in. The user shouldn’t have to specify the type of search they are carrying out. The system should be intelligent enough to know. That brings me nicely on to improving the results. There is a perception within many organisations that setting up site search consists of throwing some technology at the problem. Unfortunately nothing could be further from the truth. On its own, search technology will not help us find the right things quickly. We need human expertise and human management. If you want your on site search to work effectively it will be necessary to manually tweak those results to ensure the most relevant content comes up first. You might be tempted to think that this cannot be right. After all Google is well known for the power of its algorithm. However, even Google use the human element to improve findability. And they are not alone, Twitter takes a similar approach. In short, technology is not enough. You need people improving results as well. That means somebody needs to be responsible within the organisation for monitoring and improving results on an ongoing basis. Ongoing monitoring is absolutely crucial. You need to look carefully at what people are searching on so you can improve results. However, improving results isn’t the only reason to monitor results. You will also learn a lot about your users through doing this. Monitoring will tell you what terminology people use and what they want to know about. Monitoring will tell you what terminology people use and what they want to know about. It is not uncommon for users to get zero results because they don’t use the same terminology as the organisation. On other occasions they are searching for something the organisation doesn’t currently offer but could easily introduce. Who owns your site search? There is so many other ways that on site search can be improved and we can discuss those in the comments below. However, what I wanted to communicate in this post is the importance of ownership. Search so often slips between areas of responsibility. After all it is not just a technology, design or content issue. Instead it is all three. Who then is responsible for ensuring it is kept at peak performance and do they have the time to make this happen? So what are you going to do about it? Who are you going to assign to this job and do you need some outside help getting your search up to speed? If so, you know where to come. Do users care about your latest news?